FKLI futures July contract fall marginally 2 points lower to close at 1063 as compare to previous trading session with total 3,746 lots traded in the market. FKLI traded sideways despite regional indices were traded lower during trading session. Technically, FKLI seems topped around 61.8% Fibonacci retrace level at 1069 region while manage to trade lower the uptrend channel support line upon closing. Based on our technical analyst, our opinion suggest FKLI would trade lower in the coming trading session provided resistance levels at 1069 and 1079 were not violated. 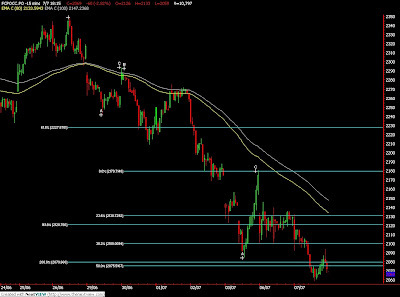 Traders were advice to hold short position while be alert around support levels at 1055 and 1047 regions. FCPO 3rd month Sept Futures contract fall RM37 lower to close at RM2010 levels as compare to previous trading session with 7,908 lots traded in the market. CPO plunge after long consolidation due to soybean oil and crude oil were traded lower during last trading hour. 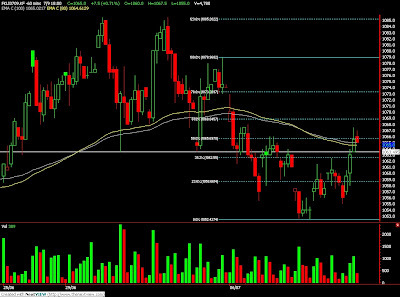 Technically, CPO price seems topped around 61.8% Fibonacci retrace level at RM2052 regions. Based on our technical interpretation, our opinion suggests CPO price currently riding on a bear rally towards downside possible of new territory of RM1950 and RM1930 regions. Traders were advice to hold short position around resistance levels seen at RM2032 and RM2020 regions. Critical resistance seen at RM2100 and RM2209 regions. July 10 (Bloomberg) -- Crude oil fell, capping its biggest weekly decline since January, on concern the global recession will curb energy consumption and as a stronger dollar reduced demand for commodities. Oil has plunged 10 percent this week on speculation fuel use in the U.S., the biggest energy-using nation, will drop. The greenback has risen 0.7 percent against most major currencies since the beginning of the month. Crude oil for August delivery fell 52 cents, or 0.9 percent, to $59.89 a barrel at 2:55 p.m. on the New York Mercantile Exchange, the lowest settlement since May 19. Oil has dropped 59 percent from a record $147.27 a barrel reached on July 11, 2008. Gasoline for August delivery slipped 1.33 cents, or 0.8 percent, to end the session at $1.6505 a gallon in New York. The contract declined to $1.6241 yesterday, the lowest intraday price since May 7. Confidence among U.S. consumers fell more than forecast this month. The Reuters/University of Michigan preliminary index of consumer sentiment decreased to 64.6, the lowest since March, from 70.8 in June. The index averaged 89.2 during the expansion that began in late 2001 and ended in December 2007. Worldwide consumption of crude oil will increase by 1.4 million barrels, or 1.7 percent, to 85.2 million barrels a day next year, the International Energy Agency said today in its first monthly report to include a forecast for 2010. The International Monetary Fund, in an outlook released this week, estimated that the world economy will expand by 2.5 percent in 2010. The IEA said its 2010 view may remain “broadly unchanged” once it includes the latest IMF forecast. The IEA used the fund’s April projection of 1.9 percent growth when preparing today’s report. Crude oil and fuel stockpiles in the members of the Organization for Economic Cooperation and Development rose to 2.77 billion barrels in May, about 7 percent more than last year’s level, according to the IEA. The Paris-based OECD is composed of 30 industrialized countries. The Commodity Futures Trading Commission announced on July 7 that it may clamp down on oil and natural-gas price speculators by limiting the holdings of energy futures traders, including index and exchange-traded funds. The dollar advanced 0.5 percent to $1.3946 per euro from 1.402 yesterday. The U.S. currency also gained against the pound, Swiss franc and Swedish kronor. Brent crude for August settlement declined 58 cents, or 0.9 percent, to end the session at $60.52 a barrel on London’s ICE Futures Europe exchange. The Organization of Petroleum Exporting Countries increased production for a second month in June, straying further from its official quotas, the IEA report showed. The 11 OPEC members bound by targets raised output to 26.2 million barrels a day. That lowers the group’s compliance rate with record supply cuts announced last year to 68 percent, compared with an estimate of 74 percent in last month’s report. The 11 members have a ceiling of 24.845 million barrels a day. OPEC ministers are scheduled to discuss production targets at a Sept. 9 meeting in Vienna. Oil may fall next week on speculation the global recession and payroll cuts will constrain demand, a Bloomberg News survey of analysts showed. Nineteen of 41 analysts surveyed, or 46 percent, said futures will decline. Nine expect the market will be little changed and 13 forecast that oil prices will rise. Crude oil volume in electronic trading on the Nymex was 432,333 contracts as of 3:03 p.m. in New York. Volume totaled 568,577 contracts yesterday, 14 percent higher than the average over the past three months. Open interest was 1.16 million contracts yesterday. The exchange has a one-business-day delay in reporting open interest and full volume data. July 10 (Bloomberg) -- Gold may decline as a stronger dollar and lower oil prices reduce the precious metal’s appeal as an alternative investment and hedge against accelerating consumer prices. Twenty-one of 32 traders, investors and analysts surveyed by Bloomberg News, or 66 percent, said bullion would fall next week. Five people forecast higher prices and six were neutral. Gold futures for August were down 1.6 percent for the week, at $915.80 an ounce, as of noon in New York yesterday. Crude oil, used by some investors as an indicator of the outlook for inflation, had lost 10 percent for the week at the same time. The U.S. Dollar Index, a six-currency measure of the greenback’s value, reached a two-week high on July 8. Bullion typically moves inversely to the U.S. currency. “Gold should fall next week, continuing its recent moves due to the strength of the dollar and the weakness in oil,” Leonard Kaplan, president of Prospector Asset Management in Evanston, Illinois, said by e-mail. Bullion “should be well supported at $880” an ounce, he said. The weekly gold survey has forecast prices accurately in 157 of 269 weeks, or 58 percent of the time. July 10 (Bloomberg) -- The yen and dollar advanced against the euro and Japan’s currency headed for its biggest weekly gain since May as a bigger-than-forecast slide in a gauge of U.S. consumer confidence this month encouraged demand for a refuge. The Swiss franc dropped against the dollar after the central bank’s President Jean-Pierre Roth said policy makers will continue to buy foreign currencies if needed to stop its appreciation. Russia’s ruble fell the most versus the dollar since February after Bank Rossii cut interest rates and oil prices dropped below $60 a barrel. The yen appreciated 1.2 percent to 128.81 per euro at 3:12 p.m. in New York, from 130.36 yesterday. The dollar gained 0.5 percent to $1.3948 per euro from $1.4020. The yen advanced 0.7 percent to 92.32 per dollar from 92.99. It earlier touched 91.79, the strongest level since February. Japan’s currency rose 4.1 percent versus the euro this week in the biggest rally since the five days ended May 15 as investors pared expectations the recession will end soon. The yen gained 3.8 percent versus the dollar, the biggest weekly advance since Oct. 24, while the greenback advanced 0.4 percent versus the euro. Barclays Capital lowered its one-month forecast for the dollar against the yen to 96 from 98 “in light of recent price action.” It maintains that the drop of the dollar this week is “temporary” as the global economy continues to “improve,” while the Japanese outlook is too “fragile” to sustain a stronger currency, currency strategists Yuki Sakasai in Tokyo and Paul Robinson in London wrote in a note to clients today. The ruble slid as much as 3.2 percent to 32.8190 against the dollar, its biggest drop in almost five months and the largest decline among emerging-market currencies, after the central bank lowered the refinancing rate to 11 percent. The ruble also dropped as crude oil, Russia’s largest export, fell more than 10 percent this week. The Swiss franc lost 0.7 percent to 1.0862 versus the dollar and fell as much as 0.3 percent to 1.5168 against the euro before trading little changed after Roth told the German newspaper Handelsblatt that “we stick to our policy in a decisive manner” regarding the campaign to weaken the currency. The Swiss National Bank sold the franc on March 12 to stem its gains and support the economy, pushing it down a record 3.3 percent versus the euro. The yen and dollar gained versus the euro as a gauge of confidence among U.S. consumers dropped in July after four months of increases. The Reuters/University of Michigan index of consumer sentiment fell to 64.6 from 70.8 last month. The median forecast of 59 economists surveyed by Bloomberg News was for a decrease to 70. The U.S. trade deficit unexpectedly narrowed in May to $26 billion, the lowest level since November 1999, from a revised $28.8 billion in the prior month that was lower than previously estimated, the Commerce Department reported today. “Our long-term views have become less dollar-bearish on the back of a lower U.S. trade deficit,” Themos Fiotakis, a London-based analyst at Goldman Sachs Group Inc., wrote in a research note to clients today. Goldman Sachs lowered its forecast this week for the dollar versus major counterparts in the next three months, while boosting its one-year estimate as “aggressive” easing by the Federal Reserve comes to an end. The dollar will decline to $1.45 per euro in three months, before appreciating to $1.35 in a year, according to Goldman Sachs’s forecast. The yen headed for its biggest weekly gain against the Australian dollar since October, appreciating 6.5 percent to 71.89 on signs Japanese investors are losing appetite for overseas assets. It was up 4.3 percent this week to 57.99 against the New Zealand dollar. Pacific Investment Management Co., which runs the world’s biggest bond fund, said investors who avoid Japanese government securities may miss out on a rally. “There is a huge risk not holding bonds,” Tomoya Masanao, a Pimco executive vice president in Tokyo, said in an interview on July 8. “The growth rate won’t rise much, and inflation will remain low.” Newport Beach, California-based Pimco manages $756 billion in assets. Investors have been “relatively quick” to cut their losses in commodity currencies, such as the Australian dollar, setting the stage for a rebound on “improving fundamentals,” according to the Barclays’ research note. Investors monitored by Barclays have “decidedly” turned to “dollar buying” since early June to cut “risky” assets, the firm said. July 10 (Bloomberg) -- Crude oil rose for a second day as the dollar slipped against major currencies, spurring demand for commodities as a hedge against inflation. Oil snapped a six-day slump yesterday as reports showed a drop in initial U.S. jobless claims to the lowest since January, car sales in China surged the most since 2006 and U.S. stocks rose. The U.S. Dollar Index, which tracks its value against six major currencies, dropped for the first time in six days. Crude oil for August delivery rose as much as 48 cents, or 0.8 percent, to $60.89 a barrel on the New York Mercantile Exchange, and traded at $60.80 at 9:20 a.m. Sydney time. Futures are up 36 percent since the start of the year. Prices fell $11.35, or 16 percent, during the six days from June 30, the longest losing streak this year. Yesterday, futures touched $59.25, the lowest intraday price since May 19. The dollar was at $1.4023 a euro at 6:10 a.m. in Tokyo, compared with $1.4020 yesterday on reduced demand for the safety of the U.S. currency. The pound, Swiss franc and Swedish kronor posted bigger gains against the dollar. Initial jobless claims fell by 52,000 to 565,000, a lower level than forecast, in the week ended July 4, from a revised 617,000 the prior week, the Labor Department said yesterday in Washington. Jobless claims were estimated to fall to 603,000, according to the median forecast of 40 economists surveyed by Bloomberg News. China’s passenger-vehicle sales rose 48 percent in June, the biggest jump since February 2006, after government stimulus spending spurred a revival in the world’s third-largest economy. China is the second-biggest oil consumer after the U.S. Gasoline for August gained 0.6 cents, or 0.4 percent, to $1.6698 a gallon at 8:42 a.m. Sydney time in New York. Yesterday, it climbed 3.05 cents, or 1.9 percent, to end the session at $1.6638 a gallon in New York. U.S. stocks gained as an analyst upgrade of Goldman Sachs Group Inc. spurred a rally in financial shares and a rebound in natural-gas prices lifted energy producers, tempering a drop in drugmakers. The Standard & Poor’s 500 Index added 0.4 percent and the Dow Jones Industrial Average advanced 01. percent. Brent crude for August settlement rose 67 cents, or 1.1 percent, to end yesterday’s session at $61.10 a barrel on London’s ICE Futures Europe exchange. The contract touched $59.76 yesterday, the lowest intraday price since May 26. July 10 (Bloomberg) -- The yen fell against higher-yielding currencies, paring a weekly gain, as concern eased that the global economic recovery will be prolonged. The yen weakened the most against the Australian and New Zealand dollars of the 16 most-traded currencies after the Standard & Poor’s 500 Index rose for the first time in three days, encouraging investors to buy riskier assets. The dollar headed for a weekly loss against the euro before a U.S. government report that economists say will show the trade deficit widened to the most in four months. “At a time when the global economy is on the mend, there is little reason to push the yen higher,” said Yuki Sakasai, a foreign-exchange strategist in Tokyo at Barclays Bank Plc. The yen will weaken, he said. The yen fell 0.3 percent to 73.01 per Australian dollar as of 8:26 a.m. in Tokyo, from 72.80 yesterday in New York. Japan’s currency declined 0.5 percent to 58.84 to the New Zealand dollar from 58.58. It was little changed at 93.07 against the U.S. dollar from 92.99 and traded at 130.43 per euro from 130.36. The dollar was at $1.4015 per euro from $1.4020. Benchmark interest rates are 3 percent in Australia and 2.5 percent in New Zealand, compared with 0.1 percent in Japan and as low as zero in the U.S., attracting investors to the South Pacific nations’ assets. The risk in such trades is that currency moves can erase profits. Japan’s currency still headed for a 2.9 percent weekly decline against the euro as speculation the recovery from the recession will be slow prompted investors to seek safer assets. The yen typically rises during times of financial turmoil because Japan’s trade surplus reduces the nation’s reliance on overseas lenders. Japan’s Vice Finance Minister Kazuyuki Sugimoto said at a press conference in Tokyo yesterday that the government will keep watching currency markets closely. A stronger yen may squeeze corporate profits of exporters, which could hurt households by eroding their wages, though it can also benefit consumers and companies by lowering food and energy costs, Sugimoto said. “As the ongoing recovery is still fragile, we can’t rule out the possibility of the Bank of Japan intervening in the market to prevent the appreciation of the yen if the currency breaches 90 per dollar,” said Akio Yoshino, chief economist in Tokyo at Societe Generale Asset Management (Japan) Co.
FCPO 3rd month Sept Futures contract rose RM45 higher to close at RM2047 levels as compare to previous trading session with 7,930 lots traded in the market. CPO traded higher due to firm electronic trading session for soybean oil and crude oil despite was closed weak during overnight session. 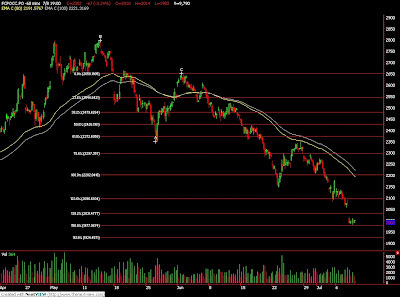 Technically, CPO seems temporary support around RM1980; 150% Fibonacci projection levels. Based on our technical interpretation, our opinion suggests CPO would trade lower in the coming trading session provided CPO instant resistance levels seen at RM2051; 61.8% Fibonacci retrace level and RM2100. 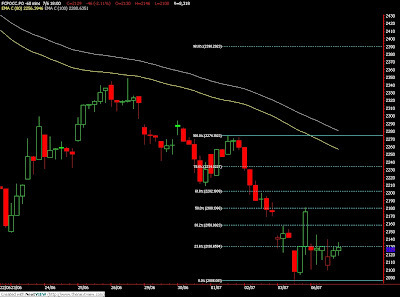 Traders were advice to hold short position if resistance levels were not violated. Supports were seen at RM2004 and RM1980 regions. FKLI futures July contract rose 7.5 point higher to close at 1065 as compare to previous trading session with total 4,780 lots traded in the market. FKLI was traded strong yesterday as regional indices and Dow Jones electronic trading turn upwards during trading session. 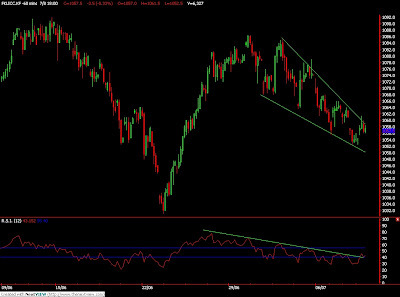 Technically, FKLI seems manage to break up above falling wedge trend line in the hourly chart. Based on our technical knowledge, our opinion suggests FKLI would traded confirm traded higher provided resistance levels at 1070 and 1079 were violated. Traders were advice to hold long position once the resistance levels were breach while be cautious around support level at 1063.5 and 1052 regions. July 9 (Bloomberg) -- Palm oil futures gained for the first time in four days on speculation that an 8 percent drop in the previous three days was excessive and may lure buyers. The futures slipped below 2,000 ringgit ($559) yesterday for the first time since March 31 on concern a seasonal increase in production in the second half would swell stockpiles and after soybeans, crushed to produce a rival edible oil, dropped to the lowest in more than three months. “While we are of the view that prices are not likely to turn around in a significant manner from current levels over the next few months, we believe that the 2,000 ringgit a ton mark is a good fundamental support level,” a report by RHB Research Institute Sdn. analyst Hoe Lee Leng said today. Palm oil for September delivery on the Malaysia Derivatives Exchange gained as much as 1.8 percent to 2,037 ringgit a metric ton after earlier touching 2,000 ringgit. The contract paused at 2,022 ringgit at the 12:30 p.m. break in trading. Prices won’t “fall substantially below” 2,000 ringgit in the short term, the RHB Research report said. Palm oil for January delivery in Dalian rose for the first time in six days, advancing 0.4 percent to 5,566 yuan ($815) a ton at the 11:30 a.m. trading break. China is the biggest consumer of edible oils and the largest importer of palm oil. Oil crushed from soybeans competes with palm oil as the two are used in applications including cooking and biofuel. Soybean oil is trading at a premium of about 30 percent to palm oil, according to Bloomberg data. Soybeans for November delivery on the Chicago Board of Trade rose as much as 1.8 percent to $9.0775 a bushel. Soybean oil for December delivery rallied as much as 2 percent to 33.56 cents a pound in Asian trading and was at 33.25 cents at 12:57 p.m. Singapore time. Indonesia and Malaysia, which account for about 90 percent of palm oil production, have forecast record output this year. More than half the annual output in the countries is usually produced in the second half. Stockpiles in Malaysia gained for the first time in six months in May as production climbed 8.5 percent, the biggest month-on-month increase in a year, the Malaysian Palm Oil Board said on June 10. It will announce June data tomorrow. July 8 (Bloomberg) -- OPEC says the world will need less crude oil from the group in 2013 than it did last year as the lingering impact of recession crimps demand and rising biofuels supply makes up for shrinking production elsewhere. The Organization of Petroleum Exporting Countries, whose members supply about 40 percent of the world’s oil, slashed its forecast for global oil consumption in 2013 by 5.7 million barrels to 87.9 million barrels a day. OPEC will have to produce 31 million barrels of crude daily in 2013 to satisfy demand, compared with 31.2 million barrels last year, it predicted in an annual report today. Oil’s slump from record high prices in July last year led OPEC to agree production cuts of 4.2 million barrels a day as the worst global recession since the Second World War reduced oil demand. The group has pledged to maintain its cuts, even as prices recovered above $60 a barrel on optimism that the worst of the recession is over. OPEC estimates the world’s need for its crude or so-called “call on OPEC crude” by comparing total global oil demand with supplies of crude, natural gas liquids and non-conventional fuels from outside the group, such as biofuels and Canada’s oil sands, in addition to OPEC’s own natural gas liquids and non- conventional fuel supplies. The slump in demand has also led the group to lower its estimate for the amount of investment in new production projects required through 2013 by 30 percent to about $115 billion on new capacity. That compares with last year’s prediction of $165 billion. More than 35 projects planned in the next four years, or a total of 5 million barrels a day of additional crude and NGL production, are likely to be shelved until after 2013, it said. “The surge in investment plans in OPEC member countries that were aimed at addressing perceived market tightness, particularly in 2007 and the first half of 2008, would in actuality have turned out, at least partially, to be unneeded capacity,” OPEC’s report said. Still, the group sees spare production capacity in member countries rising to “comfortable” levels of more than 6 million barrels a day in 2013. Global oil demand will rise 0.5 percent next year to 84.6 million barrels a day, up from 84.2 million barrels a day in 2009, according to the group’s estimates. OPEC’s forecast for 2009 oil consumption is 4 million barrels a day lower than it predicted in last year’s report. Thereafter, demand is expected to rise about 1 million barrels a day yearly through 2013 when it will be 4.4 percent higher than this year. OPEC estimates that consumption in the developed countries in the Organization of Economic Development and Cooperation will drop 1 percent in 2010 to 45.5 million barrels a day and remain at that level through 2013. The group also cut its prediction for oil production in non-OPEC member states. Output is forecast to rise 2 percent, or 1 million barrels a day, to 51.4 million barrels a day in 2013, according to the outlook. That is more than 4 million barrels a day lower than OPEC forecast last year. As non-OPEC crude oil production is expected to decline through 2013, rising output of non-conventional fuel will drive most of the increase in non-OPEC supply. Non-conventional fuel supplies are expected to rise by 1 million barrels a day from 2009 to 2013, mainly attributable to rising biofuels production in the U.S., Brazil and China, according to OPEC. NGLs production will increase 0.4 million barrels a day, the group estimates. Additionally, OPEC predicts that its own production of natural gas liquids and gas-to-liquids fuel will rise 1 million barrels a day to 5.7 million barrels a day in 2013, further reducing the call on OPEC crude. OPEC also cut its forecast for oil demand in 2030 to 105.9 million barrels a day from its estimate last year of 113.3 million barrels a day because of increased efficiency and lower than forecast economic growth. Developing countries are likely to account for most of the rise, with almost 80 percent of the net growth through to 2030 in developing Asia, OPEC said. OPEC’s medium-term “reference scenario” estimates are based on the world economy shrinking by 1.3 percent this year and rising thereafter to 3.5 percent growth in 2013. July 9 (Bloomberg) -- Crude oil rebounded from a seven-week low as some traders took the view that the decline in prices during the longest losing streak this year was overdone. Oil snapped six days of losses after dropping 4.4 percent to $60.14 a barrel yesterday, the lowest settlement since May 19. Prices have declined 15 percent since June 29. Crude oil for August delivery gained as much as 54 cents, or 0.9 percent, to $60.68 a barrel on the New York Mercantile Exchange. Oil dropped as low as $60.01 yesterday. The International Monetary Fund said yesterday a rebound in the global economy next year will be stronger than it forecast in April, suggesting energy demand may recover. The Washington-based lender said in a revised forecast that the world economy will expand 2.5 percent in 2010, compared with its April projection of 1.9 percent growth. A contraction this year will be 1.4 percent, worse than an April forecast for a 1.3 percent drop, the IMF said. Crude oil “got very close to $60 and probably attracted a bit of buying support around that level,” said David Moore, a commodity strategist at Commonwealth Bank of Australia in Sydney. U.S. oil inventories fell 2.9 million barrels to 347.3 million last week, the lowest since January, an Energy Department report showed yesterday. Refineries operated at 86.8 percent of capacity, down 0.2 percentage point from the previous week, the department said. Gasoline stockpiles climbed 1.9 million barrels to 213.1 million in the week ended July 3, more than twice the increase forecast in a Bloomberg News survey, the Energy Department said. Inventories of distillate fuel, a category that includes heating oil and diesel, rose to the highest since 1985 as consumption dropped to a 10-year low. Distillate fuel inventories rose 3.74 million barrels to 158.7 million, the biggest gain since January, the report showed. The increase left supplies last week 30 percent higher than the five-year average for the period. Gasoline inventories were forecast to increase 900,000 barrels last week, according to the median of 16 responses in a Bloomberg News survey. Supplies of distillate fuel were estimated to rise 1.83 million barrels. Total U.S. daily fuel demand averaged 18.4 million barrels in the past four weeks, down 5.9 percent from a year earlier, the report showed. Distillate consumption fell 12 percent to 3.27 million over the period, the lowest since July 1999. Gasoline for August delivery rose 1.52 cents to $1.6485 a gallon at 9:17 a.m. Sydney time in New York. Yesterday, it declined 9.95 cents, or 5.7 percent, to settle at $1.6333, the lowest settlement since May 6. It was the biggest one-day drop since March 30. Brent crude for August settlement rose 20 cents, 0.3 percent, to $60.63 a barrel on London’s ICE Futures Europe exchange at 10 a.m. in Sydney. Yesterday, it declined $2.80, or 4.4 percent, to $60.43, the lowest settlement since May 25. July 8 (Bloomberg) -- Cash bids for soybeans at export terminals near New Orleans narrowed their premium relative to Chicago futures on speculation that offshore demand for U.S. supplies is declining. The so-called spot-basis bid, or premium, offered for soybeans shipped to the New Orleans area fell to 95 cents to $1 a bushel above July futures on the Chicago Board of Trade, from $1.10 to $1.38 yesterday, the U.S. Department of Agriculture said today in a report. The premium over August futures narrowed to 65 cents from 65 cents to 95 cents yesterday. “That really tells you that the guy who needs to be covered next month is not there today, he’s going to wait to buy,” said Jeff Hainline, president of Advance Trading Inc. in Bloomington, Illinois. Soybean futures for November delivery fell 3 cents, or 0.3 percent, to $8.92 a bushel on the CBOT. The price earlier touched $8.8125, the lowest since March 16. The July contract dropped 4.4 percent to $10.84 a bushel. FCPO 3rd month Sept Futures contract traded fall RM67 lower to close at RM2002 levels as compare to previous trading session with 9,790 lots traded in the market. CPO plunge as soybean oil and crude oil were traded lower during trading session. 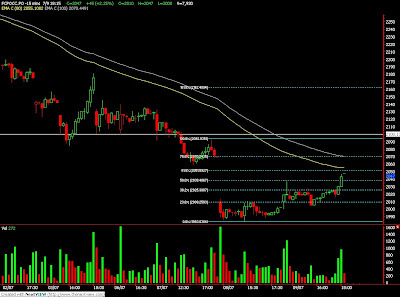 Technically, CPO seems temporary support around RM1980; 150% Fibonacci projection levels. Based on our technical interpretation, our opinion suggests CPO would trade lower in the coming trading session as previous support levels at RM2093 was violated while next support levels seen at RM1980 and RM1930 regions. Traders were suggest to hold short position while be cautious around resistance levels at RM2024 and RM2100 regions. FKLI futures July contract fall 3.5 point lower to close at 1057.5 as compare to previous trading session with total 6,327 lots traded in the market. FKLI was traded sideways despite Dow Jones overnight closing and regional indices were traded weak. Technically, FKLI manage to break down from the symmetric triangle but seems supported above 1052; 61.8% Fibonacci retrace level. Based on our technical knowledge, our opinion suggest that FKLI would trade lower profit resistance levels at 1063 and 1068 must not be violated. 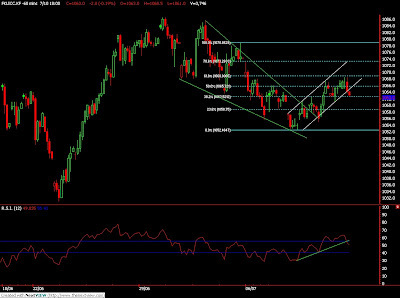 Trader were suggest to hold short position while be cautious around support at 1052 and 1047 levels. July 8 (Bloomberg) -- Palm oil futures dropped below 2,000 ringgit for the first time since March 31 after soybean declined and on concern a seasonal increase in production in the second half would swell stockpiles and damp prices. Soybeans declined to the lowest in more than three months yesterday in Chicago. Shifts in the oilseed’s price can lead trends in palm oil as the two are used in the same applications, including cooking and biofuel. Palm oil for September delivery on the Malaysia Derivatives Exchange slipped as much as 4.1 percent to 1,984 ringgit ($557) a metric ton. It paused at 1,989 ringgit at the 12:30 p.m. break in trading. Indonesia and Malaysia, which account for about 90 percent of palm oil production, have forecast record output this year. More than half of annual output in the two countries usually occurs in the second half. Stockpiles in Malaysia gained for the first time in six months in May as production climbed 8.5 percent, the biggest month-on-month increase in a year, the Malaysian Palm Oil Board said June 10. It will announce June data on July 10. Inventories will remain high if export demand from China and India, the biggest buyers of the tropical oils, slows. Malaysia’s exports gained 2.3 percent to 1,220,513 tons in May, the Palm Oil Board said. Preliminary data from independent surveyors shows June exports were little changed, with Societe Generale de Surveillance reporting an estimate of 1,227,663 tons and Intertek 1,230,741 tons. Palm oil for January delivery in Dalian dropped as much as 4.8 percent to 5,500 yuan ($805) a ton, and closed the morning trading session at 5,530 yuan. China is the biggest consumer of edible oils and the largest importer of palm oil. Soybeans for November delivery on the Chicago Board of Trade yesterday fell by the 70 cent daily limit to $8.93 a bushel, the lowest since March 16. Soybean oil for December delivery dropped 3.9 percent to 33.72 cents a pound yesterday. U.S. soybean acreage will be the biggest ever this year after rains forced farmers to switch away from corn, cotton and wheat, which need to be planted earlier, the Department of Agriculture said June 30. The U.S. crop is crucial after soybean stockpiles left over from last year’s harvest totaled 597 million bushels as of June 1, a five-year-low, the USDA data showed. Argentina, the largest soybean oil exporter, lost one-quarter of its soybean crop this year because of a worst drought in seven decades. The risk of El Nino weather developing across the Pacific Basin has grown, Australia’s Bureau of Meteorology said today. El Nino causes drier-than-usual conditions in Asian countries including Indonesia and Malaysia. “Conditions have reached a point that, should they persist at such levels through the remainder of the southern winter and into spring, 2009 will be considered an El Nino year,” the bureau said on its Web site. July 8 (Bloomberg) -- Crude oil fell, poised for the longest losing streak since December, as equities slumped and an industry report showed an increase in U.S. fuel inventories. Oil declined for a sixth day after the American Petroleum Institute said gasoline supplies rose 767,000 barrels to 212.4 million last week. U.S. stocks fell on concern technology spending will slow and second-quarter earnings will fail to justify a four-month rally in equities. Crude oil for August delivery fell as much as 88 cents, or 1.4 percent, to $62.05 a barrel on the New York Mercantile Exchange, the lowest since May 26. Oil was at $62.16 at 10:28 a.m. in Sydney. Oil in New York has declined 15 percent from an eight-month high of $73.38 reached June 30 as lower U.S. payrolls raised concern that the economy of the world’s biggest energy-consuming country will be slow to recover. The Standard & Poor’s 500 Index fell yesterday to the lowest level since May 1, dropping 2 percent to 881.03 in New York. The Dow Jones Industrial Average lost 161.27 points, or 1.9 percent. “If it is the middle of July and the U.S. consumer has excess supply of gas, then expect prices to start heading lower,” Sander said. Crude oil inventories dropped 1.4 million barrels to 348.3 million, according to the API report. Stockpiles of distillate fuel, a category that includes heating oil and diesel, climbed 3.42 million barrels to 158 million, the highest since 1985. The API collects stockpile information on a voluntary basis from operators of refineries, bulk terminals and pipelines. The government requires that reports be filed with the Energy Department for its weekly survey. Gasoline inventories rose 900,000 barrels last week, according to a Bloomberg News survey conducted before today’s Energy Department report. The Department is scheduled to release its Weekly Petroleum Status Report at 10:30 a.m. in Washington. Gasoline for August delivery declined 2.18 cents, or 1.3 percent, to $1.7110 a gallon at 10:23 a.m. in New York. Yesterday, it fell 0.76 cent, or 0.4 percent, to end the session at $1.7328. Oil also fell as the dollar advanced against the euro, reducing the appeal of commodities as an inflation hedge. The euro traded at $1.3906 at 10:19 a.m. Sydney time from $1.3924 yesterday and $1.4142 on July 1. Brent crude for August settlement declined 71 cents, or 1.1 percent, to $62.52 a barrel at 10:18 a.m. in Sydney on London’s ICE Futures Europe exchange. Yesterday, Brent fell 1.3 percent to $63.23, the lowest settlement price since May 27. July 7 (Bloomberg) -- U.S. regulators say they may clamp down on oil and gas price speculators by limiting the holdings of energy futures traders, including index and exchange-traded funds. The hearings come amid increased scrutiny of the impact of speculators on oil prices. Senator Bernie Sanders, a Vermont independent, and Representative Bart Stupak, a Michigan Democrat, blame speculators for last year’s surge in crude-oil prices to a record $147.27 a barrel and called for CFTC action to avert a repeat. Oil has climbed 41 percent this year in New York trading, while demand has dropped and inventories climbed. Among the questions the agency will ask is whether it needs additional authority from Congress to apply the limits across all markets, Gensler said. The agency didn’t specify dates when the hearings would take place or who would be asked to speak. In an interview last week, the chairman, who took office in May, said he had called on the agency’s staff to review all available options for ensuring fair markets. Shares of Intercontinental Exchange Inc. and CME Group Inc., owners of futures markets where energy contracts are traded, fell after the CFTC plan was announced. Atlanta-based Intercontinental dropped $12.05, or 11 percent, to $98.03 today in New York Stock Exchange composite trading. CME Group of Chicago was down $15.19, or 5.1 percent, at $282.06 in Nasdaq Stock Market trading. Restrictions on trading energy futures could hurt commodities trading advisers, or CTAs, funds with about $200 billion in assets. CTAs posted gains of 13.5 percent in 2008, while hedge funds had an average loss of 22 percent, according to BarclayHedge, a Fairfield, Iowa-based fund tracker. CTAs fell 3.3 percent so far this year, according to the Barclays BTop50 Index of the largest funds. “If speculators leave the market, then the market is less liquid and you have weaker price discovery,” Balarie said. Crude oil for August delivery fell $1.13, or 1.8 percent, to $62.92 a barrel at the 2:30 p.m. close of floor trading on the New York Mercantile Exchange. Futures touched $62.35, the lowest since May 27. Regulation and oversight of deliverable futures contracts have always been necessary, said Michael Cosgrove, head of North American energy operations for broker GFI Group Inc. in New York. Energy producers may be forced to postpone or abandon some oil and natural-gas projects because the trading limits proposed by Gensler will constrain the ability of banks to act as counterparties in hedging deals, said Paul Smith, chief risk officer at Mobius Risk Group. Oil and gas companies routinely use forward contracts to lock in future revenue from production. Smaller traders likely won’t be affected by the changes, said John Brady, senior vice president at MF Global Inc., the world’s largest broker of exchange-traded funds. Members of Congress, unable to get restrictions on speculation enacted last year, have introduced measures again this year to curb financial players in commodity markets. Dorgan and Sanders had questioned President Barack Obama’s choice of Gensler to lead the CFTC because of his involvement in legislation in 2000 that exempted certain derivatives trading from oversight. Sanders has introduced legislation that would force the CFTC to invoke emergency authority to stop oil speculation. Stupak’s proposal, which was included as part of climate-change legislation approved by the House last month, would impose position limits on energy speculators across all markets. The agency is seeking input on whether it should impose such aggregate position limits, Gensler said. Gensler said in a letter to lawmakers earlier this year that speculators contributed to an asset bubble in commodities in 2008. His statement broke from former CFTC Acting Chairman Walter Lukken, who testified to Congress on Sept. 11 that there wasn’t “strong evidence” index traders were driving up prices. Gensler wouldn’t say in the interview last week if he thought the same thing was happening this year. Gensler said the CFTC is reviewing exemptions from position limits for “bona fide hedging,” after seeking public comment on whether the exemption should continue to apply to traders who are in the market for financial reasons, rather than those that actually use the commodity. The chairman also said the agency was going to improve its weekly commitment of traders’ reports by separating out swaps dealers and hedge funds from the larger category of “commercial” traders. The agency will continue to collect and report data from swaps dealers and index investors, extending a “special call” from last year, Gensler said. “Enhancing the quality of information in these weekly reports will better inform market participants and the public about the positions of the various types of traders,” he said. July 8 (Bloomberg) -- Soybeans in Chicago rose as much as 2 percent after yesterday dropping to the lowest since March. The November-delivery contract reached $9.1325 a bushel before trading at $9.115 at 9:24 a.m. in Singapore. July 8 (Bloomberg) -- The yen strengthened to a six-week high against the euro as Asian stocks fell and Japanese machinery orders unexpectedly declined, adding to signs the global recession is far from over. Japan’s currency gained the most versus the Australian dollar, South African rand and the British pound on speculation the worldwide slump will damp U.S. corporate earnings, which start today with Alcoa Inc. The South Korean won led Asian currencies lower against the dollar as pessimism about the global recovery damped demand for emerging-market assets. “Pessimism-driven play continues as the wariness about the prospects of the U.S. economy prevails,” said Daisuke Uno, chief strategist in Tokyo at Sumitomo Mitsui Banking Corp., a unit of Japan’s third-largest banking group. “The yen may reach 92 per dollar and 127 against the euro” as it attracts buying as a refuge from the global recession, he said. The yen rose to 131.44 per euro as of 10:01 a.m. in Tokyo from 132.13 yesterday in New York, after rising to 131.20, the strongest since May 22. Japan’s currency advanced to 94.56 per dollar, after rising to 94.50, the strongest since June 1. The euro traded at $1.3902 from $1.3924. The won weakened 0.5 percent to 1,279.05 per dollar. The Nikkei 225 Stock Average declined 1.8 percent and the MSCI Asia Pacific Index of regional shares fell 1.3 percent. The yen typically strengthens during times of financial turmoil as Japan’s trade surplus means the nation does not have to rely on overseas lenders. The yen stayed higher after a Japanese government report showed machinery orders, an indicator of capital investment in the next three to six months, unexpectedly declined in May. Orders fell 3 percent from April, following a 5.4 percent drop the previous month. Economists expected a gain of 2 percent, according to a Bloomberg News survey. A separate Japanese report showed the current-account surplus narrowed for a fourth month in May, adding to signs the global economy will take time to recover. The surplus shrank 34.3 percent from a year earlier to 1.302 trillion yen ($13.7 billion), the Ministry of Finance said in Tokyo. “The market showed a knee-jerk reaction to the poor data and bought the yen as a safe-haven from the global gloom,” said Mizuho Shimozono, a Tokyo-based economist at Mizuho Research Institute Ltd., a unit of Japan’s second-largest banking group. The dollar fell to a five-week low against the yen before Alcoa kicks off the earnings season as the first company in the Dow average to report results. Analysts estimate profits fell an average 34 percent at Standard & Poor’s 500 companies in the second quarter and will decrease 21 percent from July through September after plunging about 60 percent in the year’s first three months, according to data compiled by Bloomberg. The dollar also weakened for a third day against the yen on speculation the greenback’s role as the world’s reserve currency will be questioned at a Group of Eight meeting starting today in L’Aquila, Italy. FKLI futures July contract rise 4 point higher to close at 1061 as compare to previous trading session with total 4,844 lots traded in the market. FKLI was mainly traded sideways as regional indices and Dow Jones electronic trading were traded mix during trading session. 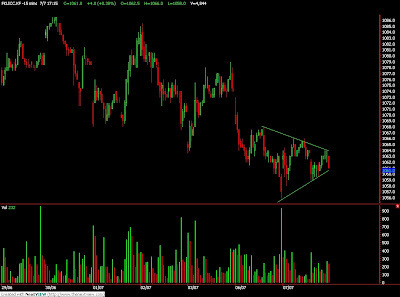 Technically, FKLI seem formed at symmetric triangle in the 15 min price chart where support seen at 1059 and 1055 regions. Based on our technical knowledge, our opinion suggest FKLI would trade lower in the coming trading session provided resistance levels at 1068 and 1079. Traders were advice to hold short position in the coming trading session while be cautious around projected figure at 1052, 1030 levels. FCPO 3rd month Sept Futures contract traded fall RM60 lower to close at RM2069 levels as compare to previous trading session with 10,797 lots traded in the market. CPO price was traded lower as soybean oil and crude oil was traded weak during overnight and electronic trading. Technically, CPO seem manage to breach pervious support at RM2100 and RM2075 levels. Based on our technical studies, our opinion suggests CPO would consolidate with immediate support seen at RM2050 and RM1930 levels. Traders were advice to trade CPO cautiously as we expect CPO enter bottoming zone while possible of trend reversal signal in the future. Immediate resistance levels were seen at RM2100 and RM2209 regions. KUALA LUMPUR, July 6 (Reuters) - Malaysian crude palm oil futures bounced off 3-month lows on Monday as India left import duties unchanged for vegetable oils, although sharply lower crude oil dented investor sentiment. Palm oil, mostly produced in Indonesia and Malaysia, has started the second half of this year on a bearish note, losing nearly 5 percent in the first week of July. "The India budget fear was a non-event but weaker oil is pulling everything down," a trader with a local commodities broker said. "Today's close is much higher the last week's so hopefully the bull is growing some legs." The benchmark September contract KPOc3 on Bursa Malaysia's Derivatives Exchange fell as much as 75 ringgit to 2,100 ringgit ($592.9) per tonne, a level unseen since April 2, but settled down 46 ringgit at the end of the session. Volumes stood at 11,624 lots of 25 tonnes each. As the second largest consumer of vegetable oils in the world, India allows tax free imports of crude variants, while it levies a 7.5 percent tax on refined imports. But crude oi CLc1, falling to around $64 a barrel, kept risk appetites low. Global vegetable oil markets move in tandem with crude oil prices as soyoil and rapeseed oil in South America and the United States are used as a feedstock for biofuel. U.S soyoil for July delivery BON9 dropped 1.1 percent and the most-active January soybean oil contract DBYU9 on China's Dalian Exchange fell nearly 1 percent. Producers in Medan, home to Indonesia's main palm oil export port of Belawan, did not hold any palm auction. Meanwhile, refiners in Jakarta offered refined, bleached, deodorised (RBD) palm oil, used as cooking oil, at 6,900 rupiah per kg, unchanged from Friday. July 7 (Bloomberg) -- Crude oil traded near a five-week low on a stronger dollar and concern slow fuel consumption will lead to an increase in stockpiles. Oil was below $65 a barrel in New York as the dollar advanced against the euro, reducing the appeal of commodities. U.S. gasoline inventories probably increased 1 million barrels last week from 211.2 million, a Bloomberg News survey showed. Crude futures reached an eight-month high of $73.38 on June 30, from about $32 in December. Oil for August delivery was at $64.28 a barrel, up 23 cents, at 8:32 a.m. Sydney time on the New York Mercantile Exchange. Yesterday, the contract fell $2.68, or 4 percent, to $64.05, the lowest settlement since May 27. A rising dollar reduces the attraction of raw materials such as oil and gold to investors. The dollar was at $1.3990 per euro at 8:09 a.m. in Singapore, from $1.3984 yesterday. Ten analysts surveyed forecast a gain in U.S. gasoline inventories, one said there was a drop and one expected no change, according to the Bloomberg survey. Crude supplies in the U.S. fell 2.9 million barrels in the week ended July 3 from 350.2 million the previous week, according to the median of 12 estimates by analysts before an Energy Department report tomorrow. Supplies of distillate fuel, a category that includes heating oil and diesel, probably rose 1.83 million barrels from 155 million. The Energy Department is scheduled to release its weekly report on July 8 at 10:30 a.m. in Washington. Gasoline for August delivery gained 1.13 cents, or 0.7 percent, to $1.7571 a gallon at 9:38 a.m. Sydney time in New York. Yesterday, it declined 5 cents, or 2.8 percent, to $1.7404. Concern that the global recession will delay a recovery in fuel demand has weighed on oil prices. Job losses in the U.S., the world’s largest energy user, were 467,000 in June, worse than forecast, and the unemployment rate rose to a quarter-century high of 9.5 percent, according to Labor Department data released on July 2. July 6 (Bloomberg) -- Gold fell to the lowest in almost two weeks as the dollar climbed and oil slid, reducing demand for the metal as an alternative investment and an inflation hedge. Silver also dropped. The U.S. Dollar Index, a six-currency measure of the greenback’s value, climbed as much as 0.6 percent. Gold typically falls when the dollar rises. Crude-oil futures fell to a five-week low in New York, while equities dropped worldwide on concern that a recovery from the global recession may falter. “Precious metals are down and essentially it is on the strength of the U.S. dollar and the overall drop in commodities,” Miguel Perez-Santalla, a Heraeus Precious Metals Management sales vice president in New York, said in a note. Gold futures for August delivery sank $6.70, or 0.7 percent, to $924.30 an ounce on the New York Mercantile Exchange’s Comex division. Earlier, the price reached $920.30, the lowest for a most-active contract since June 23. Bullion for immediate delivery fell $8.21, or 0.9 percent, to $924.04 an ounce in London at 8:19 p.m. local time. A meeting of leaders of the Group of Eight industrialized nations in Italy later this week may help investors get a better sense of where the world economy stands, Jon Nadler, a Kitco Inc. senior analyst in Montreal, said today in a report. He said the meeting also may help clarify the dollar’s status as a global reserve currency. Gold rose to $924.50 an ounce in the afternoon “fixing” in London, the price some mining companies use to sell their output, from $921.50 in the morning. Oil fell on speculation that a slower economic recovery will curb demand. Crude futures dropped as much as 5 percent to a five-week low of $63.40 a barrel in New York. The MSCI World Index of shares touched a five-week low. The index dropped in each of the past three weeks after reaching a seven-month high on June 11. “If equities remain weak through U.S. trading, combined with further dollar strength, then gold could target the recent low at $913-$914 an ounce,” John Reade, UBS AG’s head metals strategist in London, said today in a note. Silver futures for September delivery fell 17 cents, or 1.3 percent, to $13.238 an ounce in New York. The metal earlier touched $12.995, falling below $13 for the first time in two months. “In our view, given silver’s weak fundamental footing, silver prices remain the most susceptible to further downside risk, should the dollar strengthen and gold prices remain soft,” Suki Cooper, a Barclays Capital analyst in London, said today in a report. July 7 (Bloomberg) -- The yen may rise for a fourth day against the euro after European Finance Ministers said the global economic slump is not yet over and risks to recovery remain, spurring demand for the safety of Japan’s currency. The yen strengthened against 15 of the 16 most-traded currencies after Luxembourg Finance Minister Jean-Claude Juncker said at a meeting of euro-area counterparts in Brussels that “we are still in the middle of the crisis.” The euro may extend losses on speculation overseas investors will bring home income from redemption and coupon payments on 37 billion euros ($51.7 billion) in European bonds maturing this week, according to Nomura International Plc. The yen climbed to 133.19 per euro as of 8:56 a.m. in Tokyo from 133.34 yesterday in New York. Japan’s currency advanced to 95.23 versus the dollar from 95.35. The U.S. currency traded at $1.3988 per euro from $1.3984. The yen may advance to 132.50 per euro and 94.60 versus the dollar today, Ishikawa said. FKLI futures July contract plunge 17 point lower to close at 1057 as compare to previous trading session with total 6,525 lots traded in the market. FKLI plunge as regional indices and Dow Jones electronic trading were traded weak during trading session over economic worries. 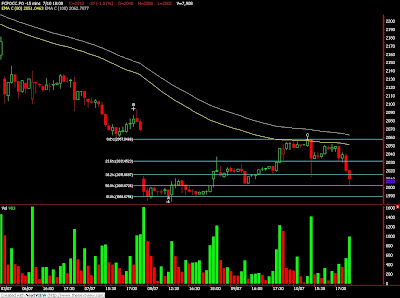 Technically, FKLI previous support levels 1068 and 1063 fail to hold against the selling pressure. Based on our wave count, our opinion suggest FKLI currently riding on the correction rally where critical support seen at 1052 and 1030 regions. Traders were advice to hold short position in the coming trading session while be alert around resistance levels 1068 and 1080 levels. FCPO 3rd month Sept Futures contract traded fall RM46 lower to close at RM2129 levels as compare to previous trading session with 8,318 lots traded in the market. CPO price was traded sideways during the trading session despite soybean oil and crude oil electronic trading plunge during trading hours. Possible soybean oil and crude oil trading trying to catch up CPO last week pit fall. 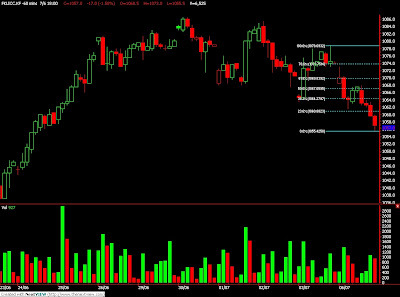 Technically, CPO daily price chart closed Doji formation after long hours of rectangular consolidations. Based on our technical interpretation, CPO price seems rested well above RM2109 region. Our opinion suggests CPO might rebound in the coming trading session where resistance levels seen RM2180 and RM2209 regions. Traders were advice to apply sideways trading measure as we expect CPO would consolidate further until trend regains strength. Support levels were seen at RM2085 and RM 2030 levels. July 3 (Bloomberg) -- OPEC is “satisfied” with the current oil price, OPEC President Jose Maria Botelho de Vasconcelos said today in Beijing. The current price is “good for all of us, the consumers and the producers,” de Vasconcelos said. The world economy has recovered and “this price is a balanced price for us,” he told reporters at the Global Think Tank Summit. Oil has risen 50 percent this year, reaching a seven-month high of $73.23 on June 11, on speculation fuel demand will rebound. OPEC is unlikely to change production quotas in September providing market conditions are similar to today with oil prices close to $70 a barrel, Kamel Al-Harami, an independent oil analyst based in Kuwait, said today. OPEC is producing about 25 million barrels of oil a day and the organization is contributing to the oil market balance, de Vasconcelos said. OPEC doesn’t have a price target, he said, when asked if $80 a barrel is the group’s oil-price goal. An oil price of $60 is “normal,” de Vasconcelos said earlier today, according to a translation of his comments on the conference’s Web site. Crude oil in New York was trading at $66.59 a barrel at 5:48 p.m. in Singapore. Oil reached a record $147.27 a barrel in July and dropped to about $33 in December. The market is “very fragile and tiny unrest could result in big shocks on the oil price,” de Vasconcelos said. July 6 (Bloomberg) -- Crude oil fell on a stronger dollar and speculation U.S. fuel inventories will increase as the recession curbs demand in the world’s biggest energy-consuming country. The dollar climbed against the euro, limiting investors’ appetite for assets to hedge against inflation such as commodities. Eighteen of 37 analysts surveyed by Bloomberg News, or 49 percent, said futures will decline through July 10. Crude oil for August delivery fell $1.57, or 2.4 percent, to $65.16 a barrel on the New York Mercantile Exchange at 10:06 a.m. in Sydney. Oil dropped 3.7 percent July 2 to $66.73. Electronic trades from July 3 will be counted as part of today’s session because of the U.S. Independence Day holiday. A rising dollar reduces the attraction of raw materials such as oil and gold to investors. The dollar traded at $1.3956 per euro from $1.3980 as of 8:32 a.m. in Tokyo. The dollar has risen since July 2 after worse-than-expected non-farm payroll data from the U.S.
“Oil is softer despite news of further disruptions to supply in Nigeria,” Moore said. The Movement for the Emancipation of the Niger Delta, the main militant group in Nigeria, said yesterday it attacked an oil facility run by Royal Dutch Shell Plc in the country’s southern region. Armed attacks in the Niger River delta, which accounts for nearly all of Nigeria’s oil, have cut more than 20 percent of Nigeria’s oil exports since 2006. Nigeria is Africa’s leading oil producer and the fifth-biggest source of U.S. oil imports. U.S. gasoline stockpiles climbed 2.33 million barrels to 211.2 million last week, an Energy Department report on July 1 showed. Inventories of distillate fuel, a category that includes diesel and heating oil, climbed 2.9 million barrels to 155 million, the highest since 1987. Total daily fuel demand averaged over the four weeks ended June 26 was down 5.8 percent from a year earlier, the Energy Department said. Distillate-fuel demand over the period fell 9.4 percent to 3.4 million barrels a day. Gasoline for August delivery declined 3.4 cents, or 1.9 percent, to $1.7570 a gallon at 8:58 a.m. Sydney time in New York. Brent crude oil for August settlement fell 56 cents, or 0.9 percent, to $65.05 a barrel at 8:52 a.m. on London’s ICE Futures Europe exchange.